Over the past year or so, I've been working on a series of fairly small flashlight LED drivers, which incorporate a bunch of features on a very small PCB. 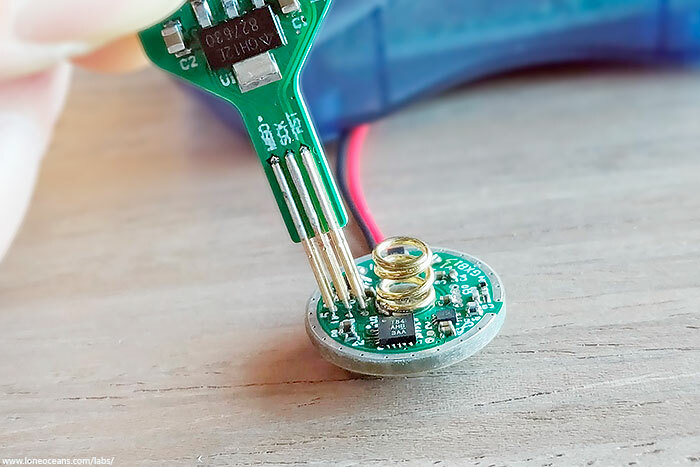 One such example is my GXB172 driver, which is a diminutive 17mm diameter in size, but has an Atmel/Microchip ATtiny841 microcontroller on board. 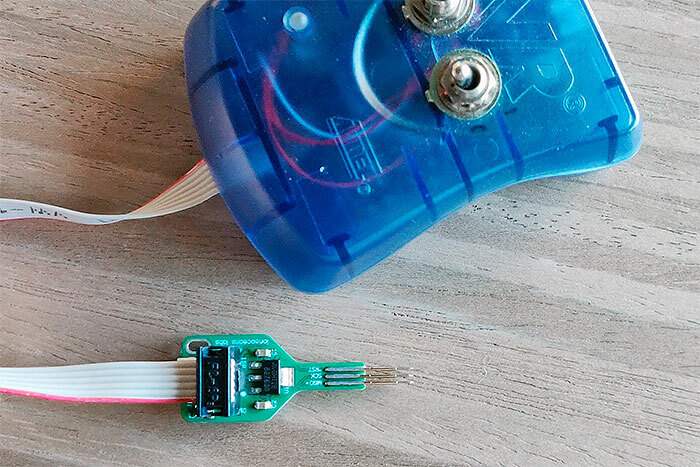 These Atmel microcontrollers can be flashed in a variety of ways, but one of the most common ways is to use In-System-Programming (ISP), commonly done with Atmel's own AVR ISP 2 programmer, or the newer Microchip/Atmel ICE programmer. Among others, there are a variety of cheaper AVR ISP clone devices including AVR USB programmer. These programmers typically use a standard 2 x 3 100-mil header for programming. Unfortunately this takes up too much space on my PCBs, so I've reduced the size of the 6 required pins to be 2 x 3 50-mil pads instead. I built the pogoProg tool as a simple way to program these microcontrollers. In this page, I'll outline the motivations of this project, how I designed this driver, and how I put them all together. Hopefully this will also be a useful resource for many like-minded hobbyists around the world :-). The pogoProg and pogoProg+ designs including schematics, layout, firmware, and architecture are available freely on this page under the Creative Commons License. An older way I used to program Atmel MCUs on small PCBs. Previously I used a fairly inelegant method to program my target MCUs suing the same 2x3 50-mil pads, but had to solder connectors or wires to it to program. This was fine for 1-off programming uses, but modifying code was complicated. Common in the EE industry is the use of simple pogo-pins for programming, such as the ones pictured above. So I decided to make my own instead. The tricky part was mounting the pogo-pins correctly in the right spacing, but I found that if I made the PCB out of 0.8mm thickness FR-4 (a fairly common thickness), they would essentially fit 50-mil spacing pads easily. 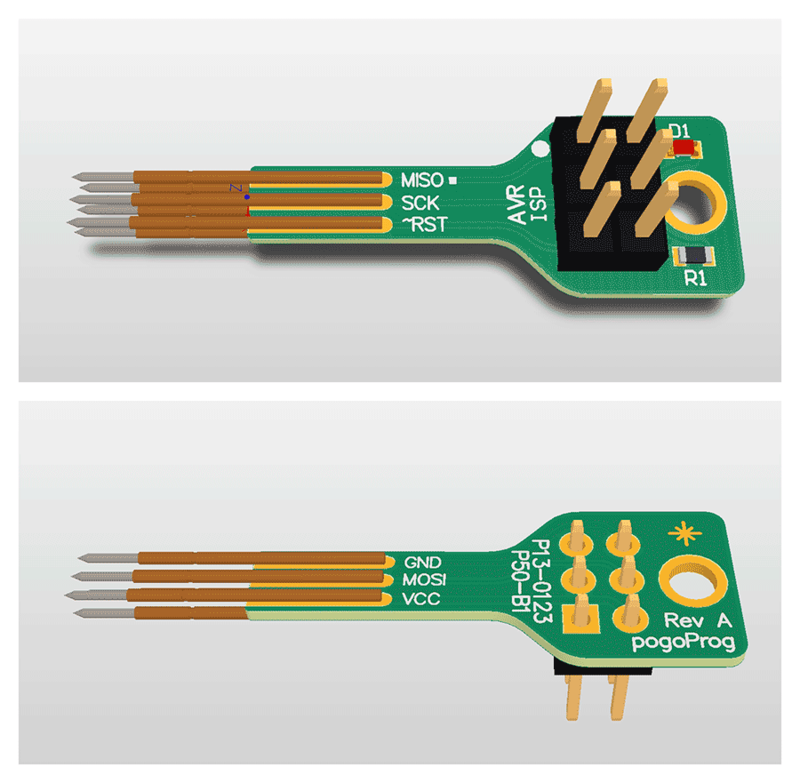 The basic pogoProg is essentially an interposer board allowing you to connect your programmer to the target microcontroller. It features an on-board LED as well which lights up when VCC is powered. Above shows the completed pogoProg after assembly. 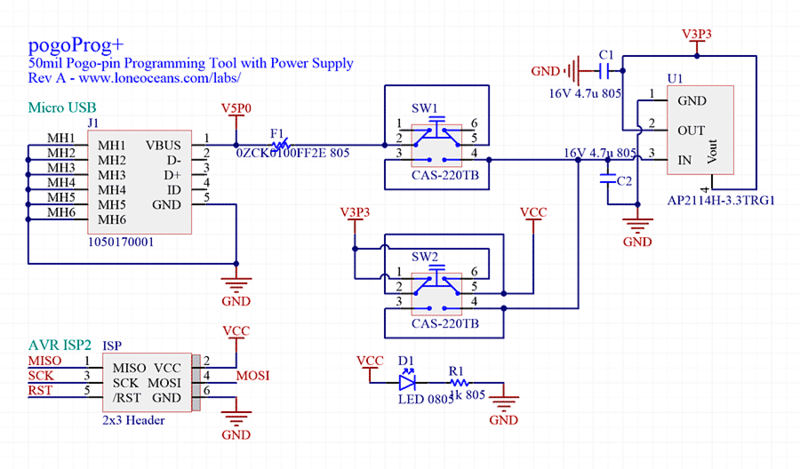 This tool does not supply power to VCC, so the target MCU needs to be powered by some external power supply. The PCB can be ordered here via OSHpark. Be sure to select the 0.8mm thickness 2oz copper option. I recommend building the pogoProg+ (below) instead of the standard pogoProg for more versatility. 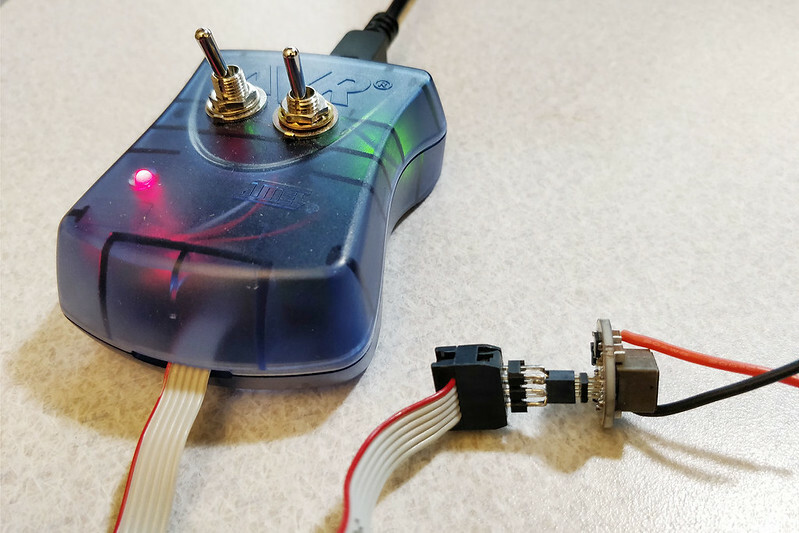 The pogoProg+ builds on the pogoProg and adds a few features, including a 3.3V voltage regulator for 3.3V programming, as well as a micro-USB header for supplying power to the VCC pin to allow the MCU to be powered without external power source. For safety, a poly-fuse is added in case of VCC - GND shorts. Two small switches on board allow power to the VCC pin be turned on or off, and for VCC voltage to be toggled between 5V and 3.3V. and architecture are available freely here under the Creative Commons License. 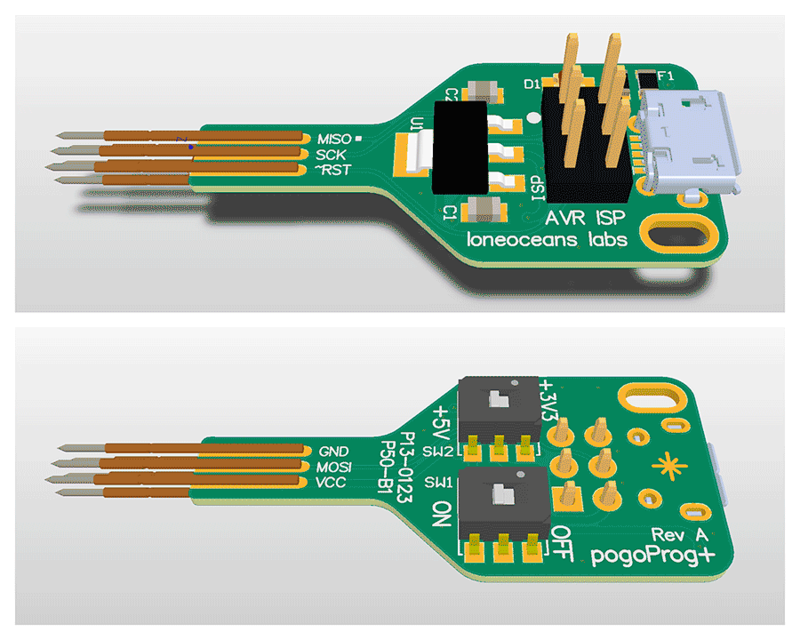 Above shows the schematic for the pogoProg+. You can order your own pogoProg+ here via OSHpark. 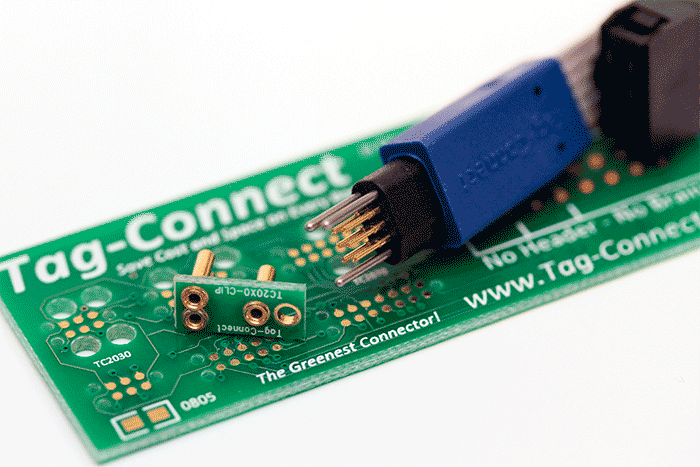 Be sure to order the board in 0.8mm thickness with 2oz copper. The 0.8mm thickness is required for correct pin-spacing. Components are available on Digikey or Mouser. If unavailable, feel free to substitute for a similar part. Below is the recommended layout pattern for the pogoProg as well as the associated pinout. These can be copper pads or vias. The square pad designates pin 1, but it can be in any shape you like. It is recommended for pin 1 and pin 6 to be vias for easier registration of the pogoprog, but these are not required. The via drill should not exceed 0.4mm to ensure the 0.5mm pin does not go through. Above shows an example layout of the pads for use with the pogoProg, showing the 50-mil spacing. Noticed that only the GND pad has drill for registration. Any of the pads can have a drill/via added on for easier registration. The recommended drill size is 0.3mm, or 10-12 mil. The pogoProg and pogoProg+ has a 2x3 100mil header for interface with off-the-shelf programmers including the now discontinued AVR ISP 2 (but many clones still exist), the new Atmel ICE, and other USB AVR ASP programmers. 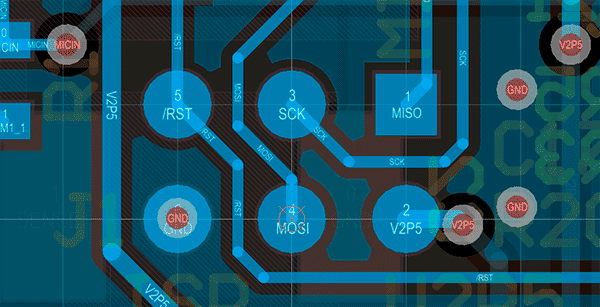 The pinout of these programmers are the same as the pads for pogoProg, with MISO being pin-1. Above shows how the pogoProg can be connected to the Atmel ICE using the 6-pin header on the AVR cable side. And above here shows how the pogoProg is connected to the Atmel AVR ISP2 programmer. Note that this programmer is one that I modified myself to supply power to the VCC rail (usually VCC needs to be powered externally), and I found this feature very useful. As a result, this feature was replicated on the pogoProg+! Using the pogoProg is fairly straightforward. 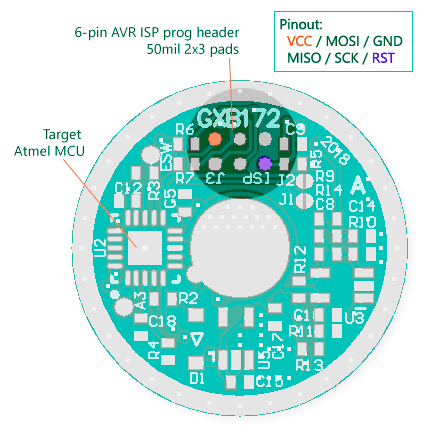 Let's take a look at an example target - my GXB172 driver PCB. 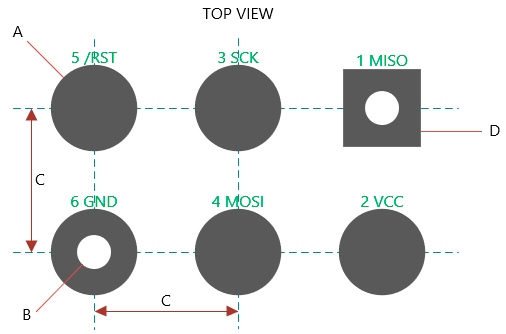 Above we can see the 6-pads corresponding to VCC, MOSI, GND, MISO, SCK and /RST. After the microcontroller is soldered on, the progoProg is aligned carefully. Above is another example using the progoProg+ to connect to the target physically. Note - it is very important to verify that the programmer is in full contact with all pins. When programming, keep movement as little as possible. 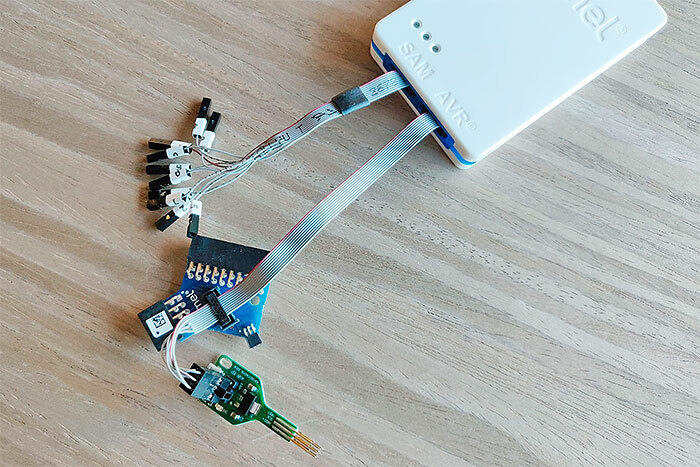 Breaking the connection when the device is in the process of being programmed can cause the target MCU to be stuck in a debug mode, which may required high voltage programming to un-brick! When programming, I usually use Atmel Studio 7.0 (free to download from Atmel's website) >> Tools >> Device programming. I verify that the device ID can be read first. Once this happens, there is good contact and programming can begin.